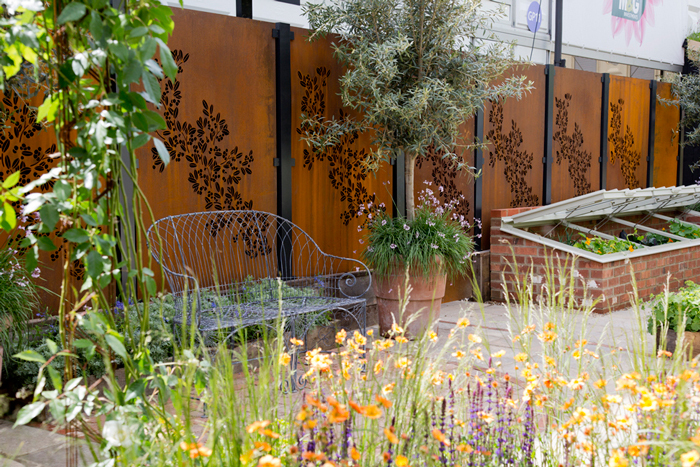 Walking around some of the RHS shows this year I kept seeing rather lovely metal fence panels with beautiful botanical designs on them. What attracted me, apart from the designs themselves, was the effect of being able to see through the panels at the flowers and greenery beyond. 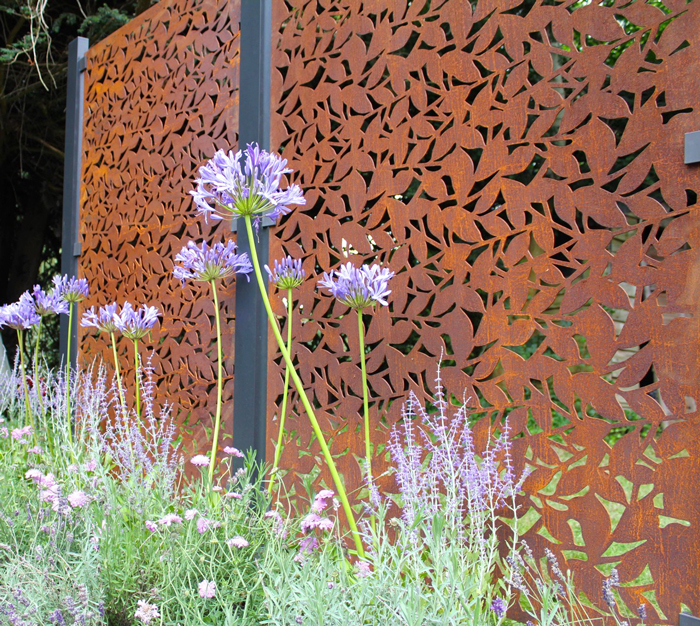 I have since discovered that the panels are an award-winning range of architectural metal fence and garden screens from Stark & Greensmith. They certainly create an instant contemporary design statement for your outdoor space and they also have the added bonus of being hedgehog-friendly. 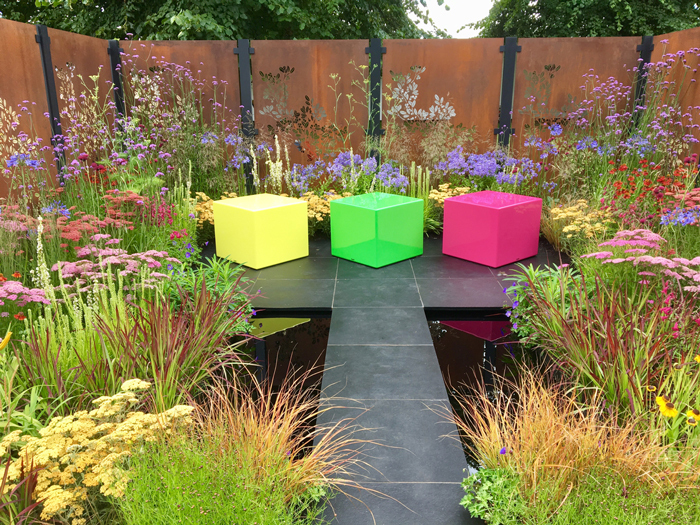 Alitex used the screens on their big trade stand at RHS Chelsea and at the inaugural RHS Chatsworth Flower Show and they were also used on Charlie Bloom’s high profile Colour Box show garden at RHS Hampton (pictured above). Then again they popped up on the best in show garden at the Harrogate Autumn show and I was well and truly hooked. The decorative panels really caught my eye and so I went on a mission to discover who makes them. 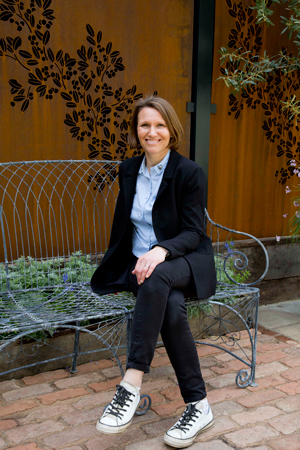 Stark & Greensmith is the brainchild of Creative Director Martine Le Gassick who set up the company in response to her frustration with the variety of fencing panels available generally. She set out to produce fence panels that were not only strong, long lasting and affordable but also beautiful, requiring virtually no maintenance and importantly would be longer lasting than traditional wooden fencing. Having worked with well-known brands such as Diane von Furstenburg, Etro and Victoria’s Secret with her previous company, Martine set about designing an affordable, modern yet practical fencing alternative for the garden. When the range was launched at the leading trade exhibition, the Landscape Show, it scooped the prestigious Best in Show award. The panels are made of either weathering steel (corten) or in powder coated aluminum. The powder-coated aluminium was chosen for its clean aesthetic quality, an appearance it maintains over time. The weathering steel was selected for the beautiful auburn rusted patina which it forms on contact with the atmosphere, with the patina stablising and protecting the material itself, meaning the panel stays strong, even in sandy or coastal environments. The panels are installed using a fixing system featuring stylish dark grey aluminium posts and powder coated steel clamps – the panels are sustainable being made from 100% recycled steel and aluminium. The long-lasting panels are laser cut with a range of beautiful botanical designs and are highly versatile. Homeowners and garden designers are now using them as fencing with a contemporary look, as pergolas and balustrades and as garden/roof terrace features or screens to give additional structure. They can also be used to mask those parts of the home or garden that owners want to keep under wraps. Unlike conventional fencing, the panels are maintenance-free, wind resistant and improve with age – the materials that are used mature rather than deteriorate. When installed, the panels float 11cm above the ground, allowing enough room for the protected hedgehog to pass freely under them. I have seen them used in a number of contexts now and have to say that my eye has been drawn to them every time. As Martine (pictured left) points out, she wanted to create products which perform better than traditional fencing by using recycled materials where possible, which won’t rot and maintenance free, with a lifespan of at least 20 years: “People are increasingly wanting to maximise their outdoor space, making their garden spaces more like an extension of their home. Garden panels are ideal for this as they are practical but also beautiful, low maintenance and have real impact, whilst still being affordable,” said Martine Le Gassick of Stark & Greensmith. “You can use them in the ground as boundary fencing, on your terrace or decking to create an intimate dining or seating area, as solar shading in pergolas, or for screening anything unsightly in your garden like a shed or bonfire, or formally as garden dividers to create ‘rooms’. The options are pretty endless. They look great at night with outdoor lighting, and in the day, the laser cut patterns cast lovely delicate shadows on grass or plants,” she added. In addition to the standard range, Stark & Greensmith also undertake bespoke commissions with current projects ranging from single panels in domestic settings through to major commercial, leisure, hospitality and public realm commissions. Martine’s innovative idea is certainly changing our perceptions of garden screens and fencing, offering us a refreshing alternative to the standard fencing options. Photo credit: All photographs © Stark & Greensmith with exception of the Alitex Chelsea photograph – credit Natalie Collins Photography.